Derakhshan Qurban-Ali is a 2017 6 Degrees Junior Fellow whose work with WelcomeHomeTO creates collaborative spaces and opportunities where newcomers and Canadians engaged in settlement efforts can connect, communicate, and collectively work towards a more effective refugee settlement experience. What is “home” and what does it mean to be a citizen? My understanding of citizenship was enriched after joining one of the Institute for Canadian Citizenship’s community citizenship ceremonies as a roundtable host. 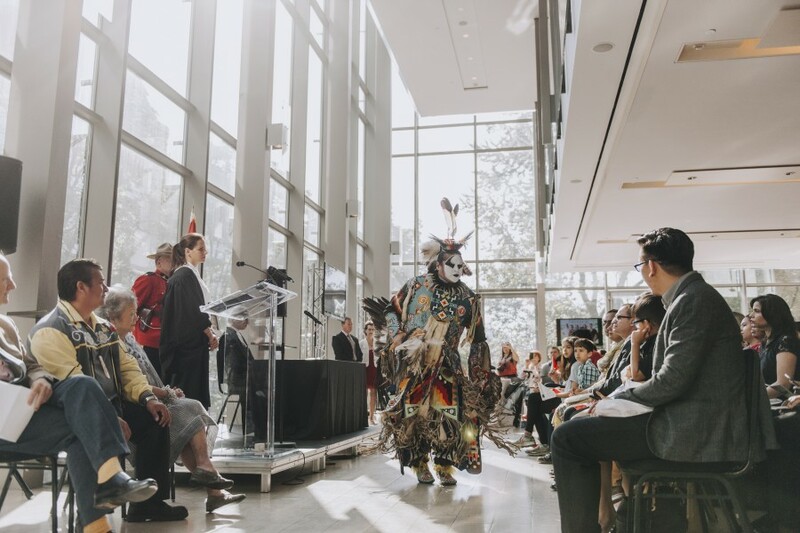 These ceremonies are a “celebration of Canada’s newest citizens, and offer unique opportunities for new citizens and community members to reflect on Canadian citizenship.” The Rt. Hon. Beverley McLachlin, Chief Justice of Canada and The Rt. Hon. 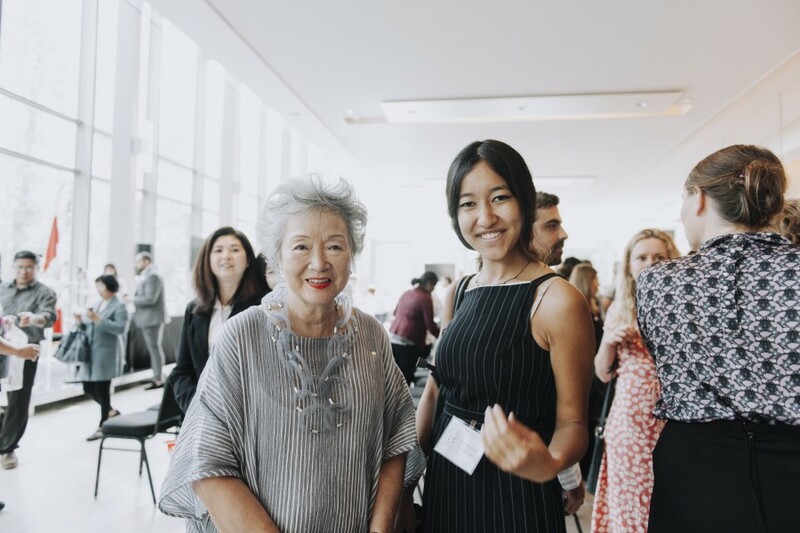 Adrienne Clarkson shared inspiring remarks about the values we hold as a nation and the rights we are entitled to as citizens. One of the most beautiful moments was during our roundtable discussion, when new citizens shared what being Canadian meant to them. The opportunity, the security, the diversity and respect for human rights – it’s so important to actively preserve these strengths. At the same time, it is important to acknowledge our country’s faults so we can work on improving them. Clayton Shirt, a traditional knowledge keeper of the Ojibway-Cree Nation, reminded us that “there were over 500 nations here before Canada was created.” Yet he welcomed the newcomers as relatives, and encouraged them to maintain their unique identities. Shirt concluded by asking newcomers to examine the past as they plan for their futures. I carried this advice throughout 6 Degrees and made an extra effort to look critically at our past as we tried to build a more inclusive future. ICC Co-Chairs and Co-Founders Adrienne Clarkson and John Ralston Saul reminded us that for centuries, Indigenous people made life possible for immigrants and settlers, and thus we owe our entire immigration policy (among other things) to Indigenous Peoples. It’s important we remember that, both during and after citizenship ceremonies. The central theme of “Home” resurfaced often throughout 6 Degrees Citizen Space. Everyone had their own definition: “where my heart beats slow,” “where I feel accepted,” or “where I can express myself and my values.” For some, home is a physical or mental space. For others, it is a process: a complex and ongoing negotiation of identity and belonging. Greek photojournalist Yannis Behrakis pointed out that “We have the choice to decide who we are and how we feel” when it comes to identity and what we consider home. However, a 360 participant rebutted that this isn’t always the case (particularly for marginalized/racialized people) because your home also has to accept and embrace you in return. A lively discussion ensued on what it meant to ask diverse Canadians “Where are you from?” and what effect this has on people feeling accepted. The lived reality for many Canadians highlights the complicated and sometimes painful relationship between citizens and their “homeland.” One of the most powerful moments during a 360 was when a young Indigenous woman described why Canada doesn’t feel like home for her. “As an Indigenous person, I don’t feel like Canada is my home… Canada wasn’t my home when my grandmother and my aunt were sent to boarding residential school and they were abused there until they were 16 … Canada wasn’t my home when my schoolmate was part of Canada’s missing and murdered Indigenous women. Canada wasn’t my home when I had a racist college roommate … Canada, I feel, has never really been my home, and I don’t know if Canada will ever really be my home.” Her courageous comment brought to light some of the invisible walls that exist in our society, and how we have a long way to go before Canada feels like a true home for all. to ensure we move toward a more just world? Sophie Grégoire Trudeau graced the stage at the The Leadership Lunch for 6 Degrees Youth Initiatives with a refreshing take on the crucial role of fostering empathy in order to tackle the causes of “walls” like fear and hate. I was pleasantly surprised that she stressed the importance of developing emotional intelligence among children, and especially boys. Some may wonder how this ties in to the themes of Walls, Bridges, Homes, but the foundations of every wall, bridge, or home are built on empathy (or lack thereof). Migrant Offshore Aid Station Co-Founder Regina Catrambone poignantly expressed that “the most difficult walls (to overcome) are the walls within our hearts.” These walls are overcome through increased empathy and dialogue, which dispel the fear and ignorance that fuel violence, nativism and xenophobia. Bridges also need to be built and strengthened among different activist movements for maximum impact, because everyone’s struggles (and triumphs) are deeply intertwined. I’m currently exploring how refugee rights groups and Indigenous rights groups can build solidarity and better support one another. But I think we can go even further and connect causes from across the board in efforts to build a stronger and more inclusive country. The way we tell our stories has a profound effect on the way we interpret the world around us. I appreciated the inclusion of art and media at 6 Degrees, because storytelling (whether visual, physical or verbal) is one of the most powerful ways to humanize the issues we are most disconnected from. This was made clear during the 6 Degrees screening of Ai Weiwei’s film, Human Flow, where he explored the staggering scale of the refugee crisis. Yannis Behrakis’ photojournalism also captured the essence of humanity at its best and at its worst through his documentation of the refugee crisis. During an Exchange, we discussed how to present people not as subjects, but as agents in their own lives in the media (particularly for marginalized people). Activist and filmmaker Will Prosper explained that the way we portray people in places like Haiti matters because “people living in these places don’t have power over their images.” Kent Monkman researched art history in order to discover how art has portrayed Indigenous people (or not portrayed them), and kept this in mind as he unveiled his most recent work, Two Ships. 6 Degrees is also about “how better language can make for better thinking and how we can reframe issues to open hearts and change minds.” This brought to mind Prosper’s comment that if we’re asking the wrong questions, we’re sure to get a flawed answer. The way we frame a conversation determines the boundaries of the solutions that we talk about. John Ralston Saul explained that part of “expanding the circle” requires coming up with new language. It is difficult to meaningfully discuss Indigenous relationships to the land through language that is grounded in a different worldview. We, as a society, need to become cognizant of the language we use and analyze its social effects. From a 360 participant: “We must keep asking: who is the ‘they’ being referred to? The ‘they,’ is also always a we, an us, an I, and a me.” Once we dissect who “they” are, we can better understand their relation to “us”. We need to ask who this language benefits and disempowers, before we can discuss solutions. but inclusion is being asked to dance. This is why I asked a question during 360: Walls about whether it’s time to update our definition of who is a “real” refugee and consequently, who deserves to migrate and therefore, to live. As climate change triggers massive displacement and migration, we need to start analyzing the metrics we use to determine who to help. We need to be able to clearly differentiate the difference between someone who is forced to leave their country because of war and someone who leaves because their kids will die of starvation if they stay. How different is it to die at the hands of a bomb/bullet versus dying because of starvation caused by drought/climate change? If we decide it is not so different, then we will require a new approach to addressing forced migration that takes into account both existing and emerging threats to human security. During Exchanges on Day 3, I was drawn to “Walled Gardens, Virtual Bridges, And Digital Homes” because I wanted to learn more about the future of digital citizenship. Conversations around e-citizenship, privacy rights, surveillance, and the idea of a “borderless internet” were led by Brett Solomon (Access Now), Joséphine Goube (Techfugees), Tara Denham (Global Affairs Canada), Ramzi Jaber (Visualizing Impact), and Irene Poetranto (The Citizen Lab). 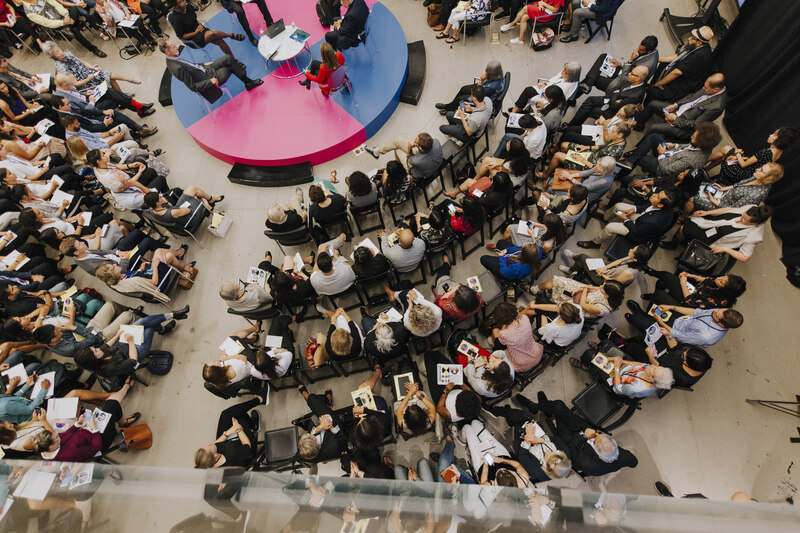 The panel attempted to show how the digital space is being used to challenge power dynamics, empower activists and combat oppression around the globe. Something that stood out to me was the concept of “path dependency.” How much of how we’re approaching issues like the refugee crisis is because of how it’s been handled in the past? How heavily does history, tradition, and custom affect the way we even frame the problem and the boundaries of its solutions? To develop innovative solutions, we need to first remove ourselves (or at least become aware of) the kind of thinking that got us here in the first place. The world is changing rapidly and some of the most effective solutions are working outside of traditional pathways and existing infrastructure. I think the work the panelists engage in are great examples of how we can pave new pathways. Traditional aid is not the answer to the global refugee crisis; as politicians fail to provide adequate solutions, civil society and everyday citizens are increasingly taking matters into their own hands. Take for instance, Techfugees, a social enterprise coordinating the international tech community’s response to the needs of refugees, which exists to empower the displaced with technology. Even here in Toronto, civic solutions (such as WelcomeHomeTO) are being developed in spaces like CivicTechTO, where diverse communities of active citizens come together to build solutions to civic challenges through technology, design or other means. Due to the grassroots nature of these groups, solutions developed in these spaces often address problems in ways that are much more flexible, dynamic and responsive to change than government efforts. As Techfugees CEO Joséphine Goube observed thoughtfully, “the internet is the only place where they don’t ask for ID…. Refugees are the real digital citizens.” It’s a powerful thought, and one that inspires me to continue reflecting on the various ways we can leverage technology to develop citizenship and build bridges, both online and offline. Diversity and inclusion are words that we hear so often that they’ve almost lost meaning. Why is “diversity our strength” and what is the difference between inclusion and diversity? A creative metaphor I once heard is “Diversity is being invited to the party, but inclusion is being asked to dance.” The difference lies in how the diversity is understood, expressed, appreciated and embraced once it is in the room. Is there space for differences to be expressed? The process matters as much as the substance and this differentiates tokenization from inclusion. Being inclusive can also mean changing our processes and the way we do things. The 360 format (inspired by Indigenous tradition) helped to alter dynamics by diffusing some of the hierarchy and walls that normally exist at such events. Participants, seated around the circular stage, were encouraged to contribute. But Malik was correct in saying “the circle needs to continue to expand.” We need to keep asking about who is not at the table and find ways to include them. During the RBC Exchange, Charlie Foran from the ICC pointed out that inclusion is not just an abstract concept or a “feeling,” but an outcome that can be measured. If inclusion can be measured, it can also be grown. One panelist explained: “you need to set a mandate and act: define, design, plan, and implement!” Once meaningful metrics exist, it is easier to develop actionable steps towards cultivating a culture of inclusivity. Sophie Grégoire Trudeau reminded us at the Leadership Lunch: “There is a commitment from civil society for Canada to continue to be a beacon of ideas.” The answers always have, and always will come from the people of this country committed to its progressive development. There won’t be a day when we can say we have completely “figured out” inclusion, because it takes sustained effort and intention to support an inclusive society; it’s an ever-adapting work in progress fuelled by the actions of engaged citizens/community members. Inclusion, then, is a habit we can cultivate. This circles back to the key message at 6 Degrees: diversity is a reality, but inclusion is a choice. One that we need to make daily. Michael Sandel concluded his lecture by reflecting on why this choice is so debated and why the topic of immigration strikes a nerve. He believes the reason is because it begs the fundamental question of: what do we owe to one another as citizens and as fellow human beings? This simple but profound question epitomizes the need for this year’s Citizen Space because its answer will determine the trajectory of not just immigration policy, but also of our values as a nation. With one in every 113 people being forcibly displaced from their homes, the need to develop a culture of inclusion is pressing. In one of my past thought pieces, I discussed why xenophobia and nativism is surging worldwide; one reason is that there are not enough people offering alternative progressive narratives on inclusion and citizenship that people can mobilize behind. Society is always reacting to the existing nativist framing of issues like immigration, instead of building something better to be inspired by. A culture of inclusion centres connection, builds community, requires growth and supports empathetic dialogue. 6 Degrees catalyzed a fresh wave of conversations on this new narrative, but it’s our duty to continue them.